Children's Fever: Should I Use Acetaminophen or Ibuprofen? 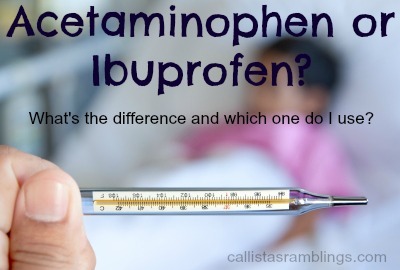 You are here: Home / Health / Childrens Health / Children’s Fever: Should I Use Acetaminophen or Ibuprofen? DISCLAIMER: I am NOT a medical professional however I am sharing what I learned from nurses who gave a talk about the subject. You should talk to your doctor before using this advice. I am not to be held responsible if you follow this advice and something happens. You agree to this if you read the post. When your child has a fever, all you want to do is make it go away so your child can feel better. The most effective method is with medication but there are different ones to choose from. 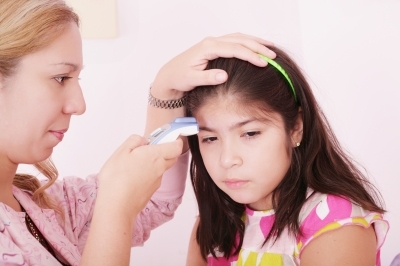 A fever is when the body temperature is above 38C or 100.4 F. Often 99F is considered a low grade fever as it’s generally above what is regular for someone. However it does not need to be treated, especially if the patient is happy and acting normally. Acetaminophen or Ibuprofen? What’s the difference? Acetaminophen (Tylenol) is designed for pain and fever and also has slight anti-nausea qualities which make it easier to digest as well. Ibuprofen (Motrin, Advil) is designed for pain, swelling and fever. It has anti-inflammatory qualities (brings down inflammation/swelling) and so is especially good for pain caused by swelling such as dental pain and joint injuries. What About the Generic Forms of Acetaminophen and Ibuprofen? The generic medications are perfectly fine to use. It’s like comparing a shirt with Gap on the front versus one with George on the label. They are both shirts and they will both cover your backs. One costs more because it has a brand name. How Much Medication Do I Give My Child? When deciding how much medication to give your child, you should be going based on your child’s weight, NOT their age. Think about it, the reason adults take more medication than children is not because we are older, it’s because our bodies are bigger so we require more of the medication. A 80lb child requires more medication than a 50lbs child, even if the 50lb child happens to be older. So always look at the weights listed on the packages before deciding how much to use. How Should I Measure the Medication? It is VERY important to use a proper measuring device to ensure your child gets the proper amount of medication and is not overdosed. A regular teaspoon is NOT accurate enough. You can get medication measuring cups, syringes and spoons at your pharmacy. Sometimes the medications come with one as well. Can I Give My Child Ibuprofen And Acetaminophen? Since the two are separate medications, they can be used together, but not at the exact same time. This is the proper way to do it. Wait 30 minutes and check temperature to see if the medication is working. You can continue to alternate the medications as long as you follow the medication’s rules of time between dosage and total dosages per day. Acetaminophen: Every 4-6 hours, no more than 5 doses in 24 hours. *You might notice that if you give your child ibuprofen every 6 hours, that would normally equal 4 times in 24 hours. Or that acetaminophen every 4 hours would be 6 doses. However it’s not safe to have it that much. Children’s fevers often go down overnight anyways and that’s also why you alternate them so they are never really going more than 2-3 hours between medication. 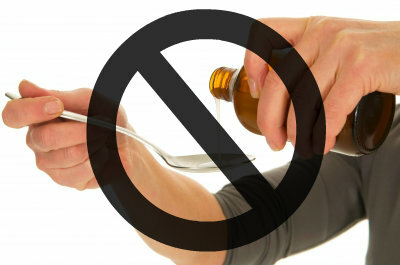 Medication should not be given to children 6 months or younger without your doctor’s permission. Ibuprofen should be used first. Ibuprofen may irritate the stomach so give with food. After the medication has been in the child’s system for an hour, if you wish to assist in bringing the fever down more, you can offer a cool cloth on the head, allow them to wear less clothes or let some cool air in. DO NOT use ice water baths or rubbing alcohol. They do not work and are dangerous. Call the doctor if your child is younger than 2 months old, your child has a fever over 40.6C(105F), your child acts/looks very sick, or any of these are present: stiff neck, persistent vomiting, purplish spots on skin, confusion, trouble breathing or inability to be comforted. If you are giving any other type of medication such as cold or cough medication, make sure it doesn’t contain acetaminophen before administering acetaminophen separately or it could result in an overdose.